Dogs Bite Decatur Al: CHARLOTTE NC - A MOTHER WAS DROPPING HER 3 DAUGHTERS OFF AT THEIR GRANDMOTHER'S HOUSE WHEN 2 PIT BULL MIXES CORNERED THEM ON THE FRONT PORCH, BIT THE MOTHER THEN PUSHED THEIR WAY INSIDE THE HOME WHEN THE DOOR WAS OPENED !!! CHARLOTTE NC - A MOTHER WAS DROPPING HER 3 DAUGHTERS OFF AT THEIR GRANDMOTHER'S HOUSE WHEN 2 PIT BULL MIXES CORNERED THEM ON THE FRONT PORCH, BIT THE MOTHER THEN PUSHED THEIR WAY INSIDE THE HOME WHEN THE DOOR WAS OPENED !!! A mother and her three daughters are recovering after a horrifying dog attack in north Charlotte. The mother was bitten twice by TWO PIT BULL MIXES who trapped the family inside a home. The attack happened on the mother's first day of her new job. She was dropping her daughters off at their grandmother’s house, on Snow White Lane, so she could drive to work when two pit bull mixes cornered them on the front porch. "When they were grabbing for my babies, I had to fight," Neshia Watson said. Watson kicked and clawed the dogs in order to protect her daughters and keep them back. "I was screaming and I was trying to get my mom back because I didn't want it to bite her," 9-year-old Madison Watson said. She was huddling behind her mother with her younger sister. The door behind them was locked because her grandmother didn't realize what was happening. Her mother was shielding them with her body when one of the dogs grabbed her leg and bit her twice. "Just as I got bitten, my mom opened the door, we fell into the door and the dogs came in on top of us, came inside the house," Neshia Watson said. A neighbor heard their screams after the dogs boxed them inside the house. "He came and got one of the chairs out of the yard and fought the dogs," Watson said. The neighbor managed to fight the dogs off with a chair that was in the yard. Once the animals were back outside, the pit bull mixes ran up to the door again. However, they were locked out when they tried to enter the house for the second time. The two dogs stood on the porch, keeping the family trapped in their home until the owner showed up. 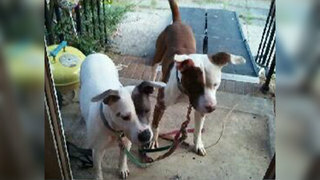 Watson told Channel 9 the owner told her she was in the shower and didn't realize her dogs were running wild. "She did apologize but the first thing she said was they're not vicious dogs, they're just playful. I said, 'But ma'am, a bite is a bite. They attacked us,'" she said. According to Animal Care and Control, the dogs that attacked Watson did not have current rabies vaccinations. Watson is going to check into a hospital to see if she's OK. Both dogs are being held by Animal Control. The one that bit Watson will be in rabies quarantine for 10 days. Officials said the owner has been cited with unprovoked bite and violating leash law. According to Animal Care and Control, the owner did not have a license for the dogs. Typical nutter. They're not vicious, they're just playful. How about for once, a nutter ACKNOWLEDGES that victims were terrified and attacked by their vicious pit bulls, instead of trying to convince victims it's all in THEIR heads. It's the other way around irresponsible pit bull owners! Why are your pit bulls running around with their tie ups attached? Not very secure, eh? Not very concerned about the pit bulls whereabouts, eh? OK. When I stab a pit bull that comes at me, that's just me being playful. That is a GREAT excuse Anon @7:55 PM! I'll have to use that one too if ever I need to use my knife on a loose shitbull! The dogs should be taken from the owner. She has proven herself unfit to own potentially lethal animals. She should not have another chance to put her neighbors in danger.